Layers of London is a collaborative project led by the Institute of Historical Research to engage the people of London in developing a record of the city’s past, using layered historic maps to record hundreds of thousands of stories, recording fresh and neglected voices, perspectives, memories and histories. The Layers of London team are offering a placement opportunity in the coming autumn months for students to get involved in the project’s research, and to present case studies of the historical information the project can present to the public. The project are asking for volunteers to give between 4-5 hours per week between 8th October and 10th December. All travel expenses will be paid, and training and a dedicated working space in London will be provided. 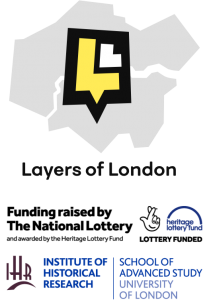 Layers of London is advertising three voluntary student placements to take place in June. Head to their website for more information. Layers of London is a digital mapping platform where users can overlay historical maps over the contemporary map of London to see how the city has changed through time. Stories and memories on the website are crowd-sourced so we can get a diverse, representative and interesting range of histories about London pinned on the map to their exact locations today! These include oral histories, photographs, stories and memories and examples include; documenting the building developments and changes in Barking and Dagenham, documenting Conscientious Objectors in Haringey and recording prisoner of war stories in Newham and much more. If you are interested in taking part, head to our website for more information and details on how to apply. The deadline to apply is 14th May.